Live score system is an integrated system designed to meet the growing information management demands of gyms. It is a powerful information system that can be integrated with our Match scoring systrem and Sports stats system. 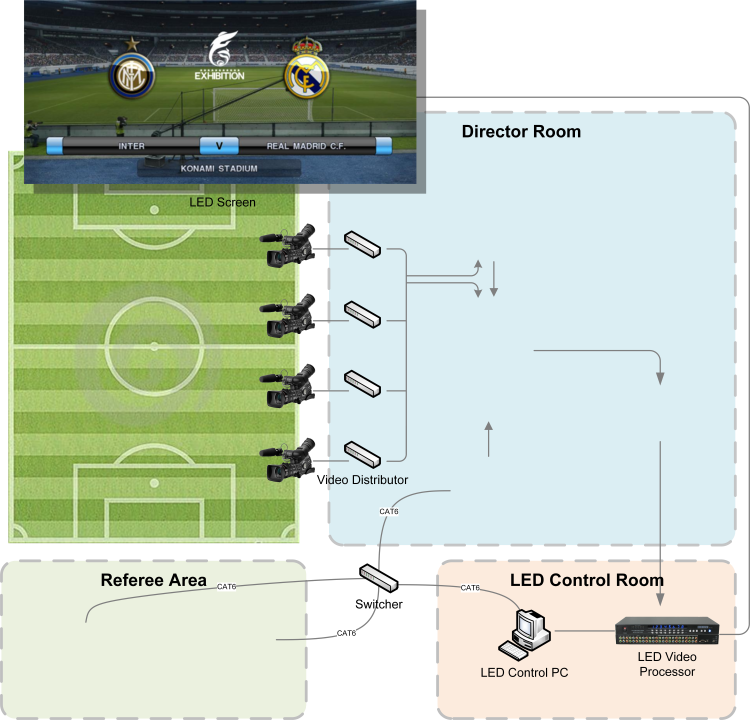 The system allows quick local edition and processing of the live video signals, which can be used to realize overlapping displaying of real-time scores, displaying of players' information, replaying of high-definition slow motions, summarizing and replaying of best moments. Used with the Match score system, this system supports overlapping displaying of real-time scores on the video. Use with the Sports stats system, this system supports overlapping displaying of player details such as shooting scores, shooting rates, assists and fouls on the video. Used with a video processor, the system can gather the best moments during the games and replay them. The system provides a text edition window where text messages can be prepared, saved and previewed in real time. It supports static subtitle, logos, subscript and superscript, which can be displayed on the same screen and at any position of the screen. It supports configuration of the times of subtitle rolling, the speed of rolling, the time interval for rolling, and the font, size, brightness, color as well as background of rolling characters. It supports production and output of Chinese and English texts. IT supports overlapping displaying of pictures with providing multiple picture templates and picture processing tools. It supports self-adaptation of subtitle. The overlapped subtitle and pictures can self-adapted to the display ratios of LED and LCD screen so that distortion of subtitle and pictures can be reduced. Video signals from multiple sources can be collected synchronously for continual video recording. Tab buttons can be used to launch slow motions and real-time replays with entry points and exit points. It is easy to distinguish columns, broadcasts, game cycles, and event summaries by using replay lists with color label. The Replay button can be used to browse from various camera angles at variable speeds. Real-time summaries can be generated automatically from the master list with intact videos (including an edition result list) output to a non-linear editor. The system provides highest-quality HD and SD, SDI, sub-vectors, Y/C and combined, 1080i, 720p, 4:3 and 16:9 SD. The system supports NTSC and PAL. Two output models are available. The one-route output model allows the operator to send out a switched replay signal to select one of the cameras for video flow to the switcher. The three-route model allows the operator to control the replay speed and feedback of three outputs from the switcher for broadcast. 1.Early-stage testing and installation of the system: we are responsible for the installation and testing of the scoring devises, score display devices, LED/LCD screens, gym score system and score display system in the early stage as well as in the system service period. 2.On-site scoring: we can conduct scoring and statistical work for the whole game. 3.Text production: we can produce subtitle according to the real-time scores and players' information. 4.Production and replay of slow motions: we can collect video signals, edit and process materials, produce and develop programs, produce and replay summaries of best moments in real time.